There are some people out there who are ruled by reason. They make their decisions based on logic, carefully weighing the facts and coming to conclusions that have sound, realistic foundations in reality. Others opt for a more… subjective interpretation of reality. These folks like to believe that things like emotion and fairness have an effect on physical phenomena. It is not above them to, in some cases, assume that reality will adjust itself to fit their whims or expectations, rather than vice versa. In extremes, neither point of view is terribly workable. And when they clash? There can be only one outcome. I’ll begin by saying that I lean fairly heavily in the logic direction, as I imagine should be fairly clear by now. And at the risk of making a few enemies… let’s just say that the “subjective reality” philosophy seems to have something of a gender bias. This is the core of the issue. Two logic-minded sorts can get along just fine, but any other combination will cause friction. Since the typical relationship contains one member of each gender, the chances are very good that at least one of you will be the sort who doesn’t let facts get in the way of a good argument. If you are in this situation, here’s some free advice: Unless lives are on the line, just the illogical person win. Yes, I know. You have facts and research and evidence to support your claims. It doesn’t matter. To your opponent, an opinion holds as much weight as a fact any day. And since new opinions can be produced at the drop of a hat, they’ll beat you on volume every time. More importantly, whereas they are arguing with you about things that you’ve observed, you are arguing with them about things that they FEEL. They are disputing facts, you are attacking their personal philosophy. You say, “But it says right here that we aren’t allowed to use frequent flyer miles on Thanksgiving weekend.” They hear, “I have no respect for you, and your feelings are worthless.” In effect, reason is a shovel, and thus you can only dig yourself deeper and deeper into an emotional grave by using it. The shovel can be tempting. You see it standing there, calling out to you. “Sure, we’re stuck in traffic, but that’s because there was a car accident AFTER we got on this road. This can’t possibly be my fault. I’ll just point that out,” you think to yourself. Dig, dig, dig. “What do you mean, I should have checked to see if there was traffic? I DID! There WASN’T. This JUST HAPPENED.” Dig, dig, dig. “Well, yes, there is another way, but has traffic lights, and it is three times longer.” Dig, dig, dig. “We couldn’t go that way anyway because we left late because of YOU!” Congratulations, you are officially in over your head. So now it is just you, in a hole, with a shovel. There’s nothing to do but keep digging and hope you can come out the other side. The worst part of the shovel is that it doesn’t just tempt the participants of the argument. 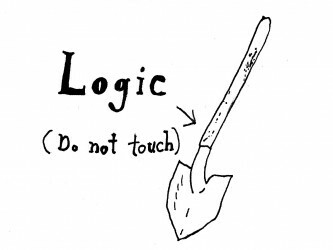 Anyone with a logical mindset will practically trip over themselves to pick up that shovel and lend you a hand. “No, no, it’s true. It would take you at least three hours if you take city streets. On the highway it is forty five minutes.” Here, let me start digging, too. “Yeah, and it doesn’t matter, because even with these delays, it should only take two hours to get there, so taking the highway was still the better choice.” Can I borrow the shovel? “I mean, just look at the difference in speed limits. It would actually be illegal to make it there on time if we didn’t take the highway.” Man, this hole is getting crowded. Hopefully I’ve made it clear that pitting facts against opinions is a fool’s errand. If you can’t wrap your head around the way their brains work, try to think of it this way. Imagine someone asked you what your favorite color was, and you said red. Now imagine that they spend the next half hour trying to convince you that your favorite color is actually blue. Wouldn’t that be idiotic and insulting? Dealing with a person who thinks that THEY know what you think better than YOU do? Well, that’s how it is for them, because for them, the world is a sequence of carefully developed and very personal dispositions. Pointing out where they diverge from the actual state of things is just rude. So the next time your significant other feels like being outraged that the chicken salad at Cosi doesn’t have shrimp in it, despite the fact that it is absolute insanity to ASSUME that chicken salad would ever implicitly have shrimp in it, just let it go. Ignore the shovel, take the blame, and get on with your life. It’s just easier that way.